The Capitol Theatre is my local movie house. It is literally a few blocks away from my apartment building, yet I almost never go. It's proximity to my home makes me take it for granted because I know it's convenient and that's its always there for me. The last time I went to the Capitol was also the first time I went and that in October of 2008 when I saw the remake of The Women (1939) with Kevin. A return visit has been long overdue. Walking home one day, I saw this signage on the door of the Capitol. Hitchcock? On the big screen? Just a few blocks from my apartment? And I don't even have to worry about parking? Huzzah! What if Alfred Hitchcock directed Dr. Strangelove (1964)? At first I brushed off the question but then I took a moment to think about it. Hitchcock would have never directed Dr. Strangelove because there are no no prominent female characters in it. Hitchcock REALLY loved his women. And he had a particular appetite for blondes. In Hitchcock films, the camera is constantly making love to the female lead. Our eye is drawn to her instinctively. It's as though we are borrowing Hitchcocks POV for a few moments. However, it's always the female lead and never the other actresses. For example, in Rear Window (1954), the viewer is in a state of constant adoration for Grace Kelly but our eyes do not rest for very long on Thelma Ritter. 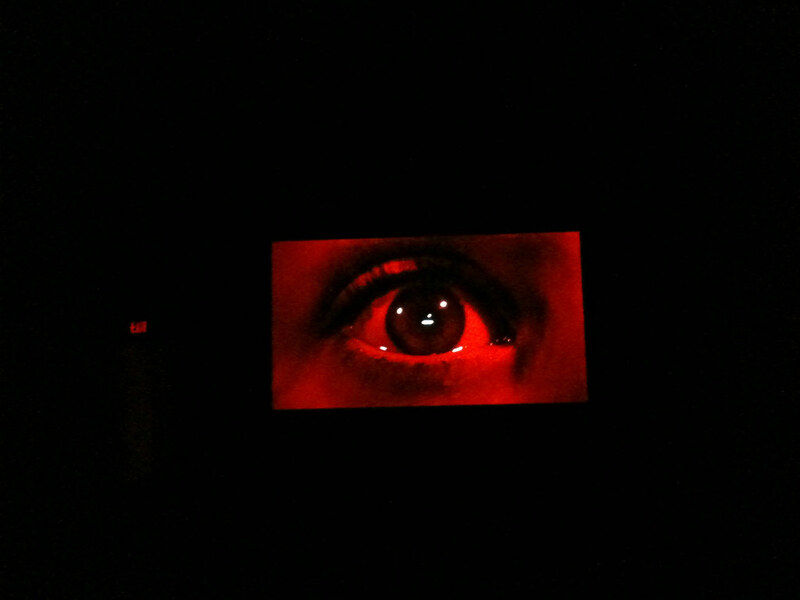 So when we watched Vertigo on the big screen, I kept an eye out for this detail (tee hee). And sure enough, Kim Novak is lovingly adored by Hitchcock's camera. I must not have paid much attention the first couple of times I had watched the movie because there were a lot of great plot points I was missing. Watching it on the big screen, forced me to pay closer attention. Vertigo has everything. Great actors, stunning visuals, a plot that keeps you guessing, action, drama and romance. Plus a Jimmy Stewart with an excessive amount of make-up on. I love how Hitchcock uses structures to represent different things. Brassieres and bridges hold things up and represent stability. Windows and door frame paint idyllic pictures but are often misleading. Ledges, rooftops and towers (heights) mean danger. The museum, cemetery, church and hotel are all purgatories for people in the present who are stuck in the past. There is enough meat in this film for an English major like me to feast on. 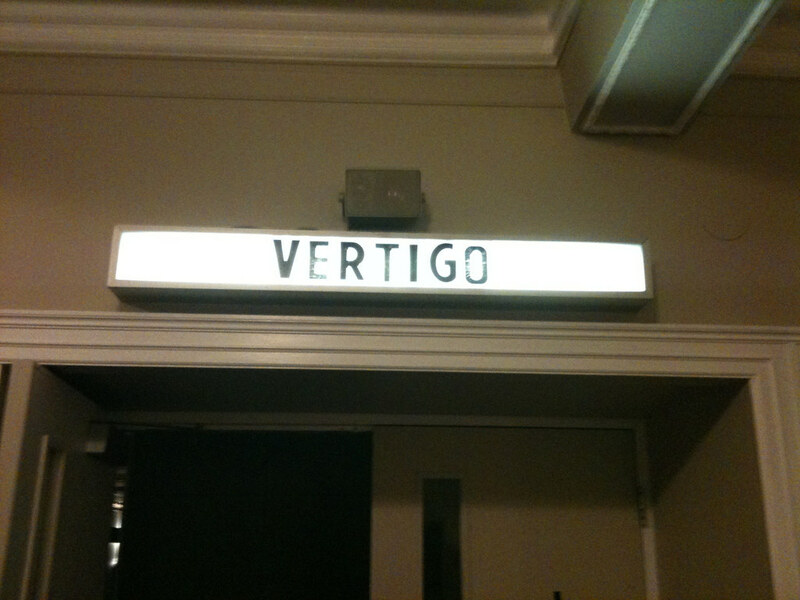 Watching Vertigo this once on the big screen is not enough. I need to own this film, watch it several times at home, take notes and break it apart. I need to watch it to analyze and watch it for fun. 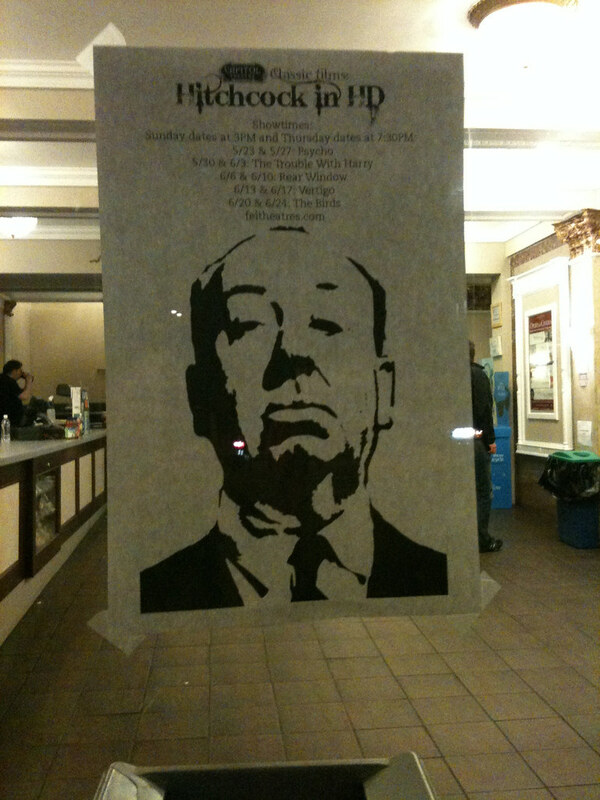 Have you watched a Hitchcock film on the big screen? If so, which one? Did it change the way you watched the film or what you thought of it? I'd love to hear your thoughts! Charles Laughton's The Night of the Hunter (1954), an adaptation of Davis Grubb's 1953 novel, is many things: a fractured fairy tale, an American gothic story, a twisted song, an homage to silent films, a 20th century re-envisioning of William Blake's Songs of Experience and Songs of Innocence and a pseudo-noir. Couchman's book is not just a love letter to the film and its creators, nor is it a personal perspective on the film. However, if you think NOTH is a masterpiece, the book will only justify your thoughts by laying out the many reasons why it is so. Couchman's book is a soup-to-nuts look at all of the elements that went into creating this classic. He takes us through every phase of the process including the writing of the novel, Laughton's vision of the movie, Grubb's drawings and James Agee's screen adaptation. Grubb's novel, the source of the story, is spoken about constantly throughout the text but you don't have to be familiar with the novel to follow along. A general understanding of the film is all you really need. I'm sure this book is better suited to the serious film student but what a treat it would be to a classic movie lover too? The rich information provided by the book makes the movie experience into a four-course meal instead of just a dessert. I would recommend this book to three different kinds of people. 1) A Film Student 2) Fan of The Night of the Hunter 3) Serious Classic Film Buff who wants to advance his or her knowledge of film. If you are a wimpy classic film fan who just likes to watch movies but not use your preicous brain cells to actually think about the films you've seen, then you are not tough enough to handle this book. For all other classic movie buffs, I throw down the gauntlet and challenge you to read this. What will separate the weak from the strong is the desire and ability amongst classic film fans to acquire knowledge, to analyze and think and to earnestly put this knowledge to good use. Are you up for it? June 15th, 2010 marked the Third Blogiversary for Out of the Past ~ A Classic Film Blog. I really wanted to do something big. A giveaway, a contest, a competition, blogathon, something, but life got in the way and so the blogiversary quietly passed me by. However, I want to take the opportunity to thank all of you for reading my blog, whether you just started or if you've been on board for the long haul. Thank you. Yesterday, the winners for the Best Classic Film Blog LAMMY award were announced. She Blogs by Night (she also blogs for TCM's Movie Morlocks) won by a landslide. However, I didn't do to shabby and ended up getting 15 votes (plus some extra votes from newbies, sorry I forgot there were rules about that). Woohoo! Those 15 votes got me second place. I think this is probably the pinnacle of my LAMMY award career. I don't think I'll ever win, especially now that there are so many great classic film blogs on the LAMB. So I'll take 2nd place, happily! Thank you so so so much to everyone who voted for me. You guys are wonderful. Cliff from Immortal Ephemera, Warren-William.com, etc. just announced the launch of the First ever Classic Movie Search! You'll never want to use plain old Google ever again. This customized search engine weeds out the irrelevant sites and focuses on classic film related sites and blogs for keyword searches. Brilliant. Cliff is still developing it and if you have a blog or site that you think should be added to the growing list, make sure you reccommend it with the form available in the 'Featured Sites' section. Do you ever wonder why TCM won't show a particular movie? Do you ever think to yourself,"How did they pick the movies for that boxed set"? Do you find that your head starts to spin whenever you try to keep all the movie studio names straight? The world of contemporary classic film distribution is complicated. Before I start, let me just clarify that when I say "classic film distribution", I mean the system in which current movie studios distribute classic films on DVD and license those same films to be shown on television channels such as TCM, AMC and Fox Movie Channel. Trying to figure out who owns what rights, who can show what, who can sell what and what studios have merged together is no easy task. Having tried to figure it out myself, I have come to the conclusion that it's pretty impossible to understand the whole system. However, a basic understanding of some key facts can help you understand the availability of certain films and the unavailability of others as well as how the system works. It's like the saying goes, in order to eat an elephant you have to go at it one bite at a time. Let's start understanding the classic film distribution by understanding how one particular boxed set came together. The Charlie Chan Collection is a boxed set I recently reviewed. Note the language on the box indicates that it's part of the TCM Spotlight collection and it's presented by Warner Home Video. Time Warner merged with Turner Broadcasting System. Time Warner owns both TCM and Warner Bros. The pre-1986 library of MGM films is controlled by Warner Bros. MGM is currently owned and controlled by Sony Pictures. Monogram films, post-1936, are controlled by Warner Bros (classified under the MGM library). Pre-1936 films are owned by Paramount which is controlled by Viacom. Fox Entertainment Group owns all the various Fox studios (20th Century Fox, Fox Searchlight Pictures, etc.) and has full control over the distribution of all of their films. They will sometimes allow channels like TCM to show films in their library. Universal Studios is owned by NBC and they control the distribution of their library of films with some notable exceptions. They also own distribution rights to films by other studios, including 5 out of the 6 Hitchcock films that Paramount released. Pathe Studios merged with RKO. The library of Pathe and RKO films is owned by Time Warner and thus distributed by Warner Bros.
1926 - Pathe releases the first Charlie Chan film The House without a Key. The film is considered lost. 1927- Universal Studios releases the second Charlie Chan film The Chinese Parrot. This film is also considered lost. 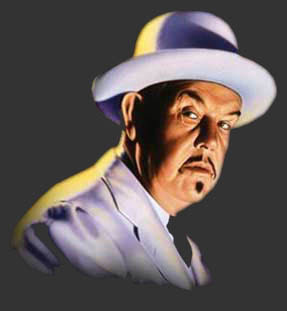 1929 - Fox acquires the rights to the Charlie Chan character. 1929-1937 - Fox releases 17 Charlie Chan films. 1 with E.L. Park, 1 in Spanish, Eran Trece, and 15 with Warner Oland. 1938 - Warner Oland dies. 1939-1942 - Fox releases 11 Charlie Chan films with Sidney Toler but then decide to abandon the franchise. 1942 - Sidney Toler buys the rights to the Charlie Chan character and starts making pictures with Monogram Studios. 1942-1946 - Monogram releases 11 Charlie Chan films with Sidney Toler. 1947 - Sidney Toler dies. TCM and Warner Bros. can distribute one lost Pathe film (if it's ever found) and all of the Monogram films (half Sidney Toler and all of Roland Winters). Fox can distribute all of the Warner Oland Charlie Chans and the first 11 of the Sidney Toler Charlie Chans. Universal Studios can only distribute The Chinese Parrot, if they ever find it. With only a few films left, TCM and Warner Bros. chose to create a boxed set with 3 Sidney Toler Charlie Chans and 1 Roland Winters Charlie Chan. And thus we get the TCM Spotlight: Charlie Chan Collection! So next time you find yourself daydreaming about the perfect DVD boxed set and wondering why it isn't available, just know that putting a boxed set together is much more difficult than you think. Quelle Note: I tried to be as accurate as possible in the post above. If you find any errors or want me to include additional information, please e-mail me at Quellelove at gmail dot com. I had the absolute pleasure seeing Kino's newly restored Metropolis (1927) with the 25 minutes of lost footage that was recovered from Buenos Aires, Argentina. What a delight! Carlos took me to the Coolidge Corner Theater in Brookline, MA and we got to see the most complete version of the film on the big screen. This is not the complete version just the most complete. There are still a few missing scenes. However, a lot of missing footage clipped from existing scenes and entire whole scenes were recovered and woven into the film. In hopes of getting this longer version of the movie out to audiences quicker, the lost scenes that were added were not digitally remastered so it's very easy to tell what was missing. One lost scene I was happy to see was with Georgy worker 11811, who switches outfits and lives with Freder, goes off galavanting in the world of the upper class. A pivotal scene which I'm sure for political reasons was removed from various versions. Having it back in the movie helps the plot line and demonstrates the great contrast between the lives of the workers and the lives of the wealthy in Metropolis. Kino is showcasing this new version in select cities across the US this summer and it will soon be on DVD. If you get an opportunity, please watch it. I had seen this film many times (including once before on the big screen) but watching this new version was like experiencing the film for the very first time. 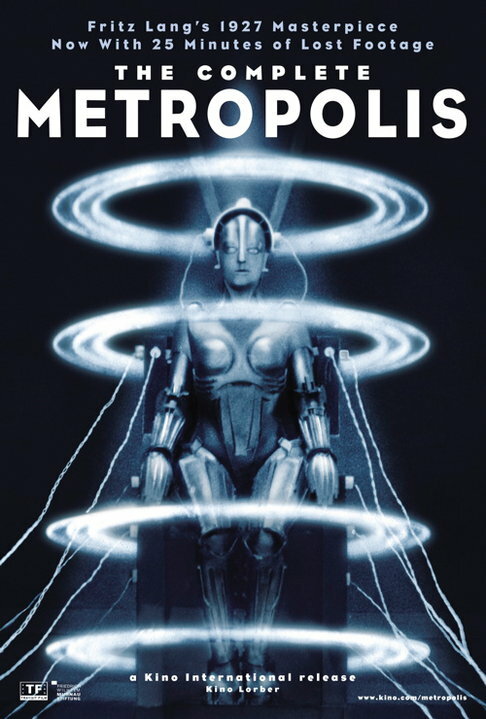 After I left the theater, I thought about what Metropolis (1927) is, because let's face it, it's more than a movie. So I came up with a list. If you have seen the newest version of Metropolis, please share your thoughts. And if you have anything you'd like to add to this list, feel free to let me know and I will add it here and credit you. I simply adore Charlie Chan movies. They are easy mysteries that are fun to watch. 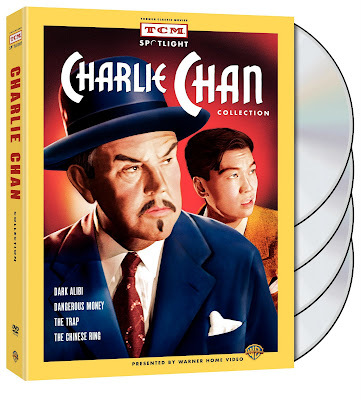 So when Warner Bros. contacted me about reviewing the new TCM Spotlight Charlie Chan Collection, I was very excited because it was a good opportunity for me to watch more films in the series, especially ones I haven't seen. This set includes 4 new-to-DVD Charlie Chans. Three Sidney Toler Chan's Dark Alibi (1946), Dangerous Money (1946) and The Trap (1946). 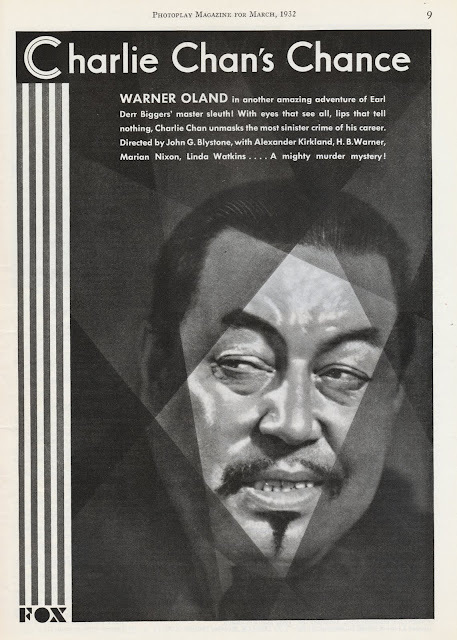 The fourth film, The Chinese Ring (1947), features Roland Winters as Charlie Chan. From what I can tell from the folks I spoke to on Facebook, many classic film fans love Charlie Chan and are well-versed in all things related to this series. Nevertheless here is a little background on the films. The Charlie Chan mysteries were a series of 6 novels written by Earl Derr Briggers. The character in the novels works for the Honolulu police but in the movie franchise, Charlie Chan, the witty and clever Chinese detective, travels all over the world solving crimes as he goes. At first the films were done with a Chinese actor in the part of Charlie Chan but those proved unpopular. 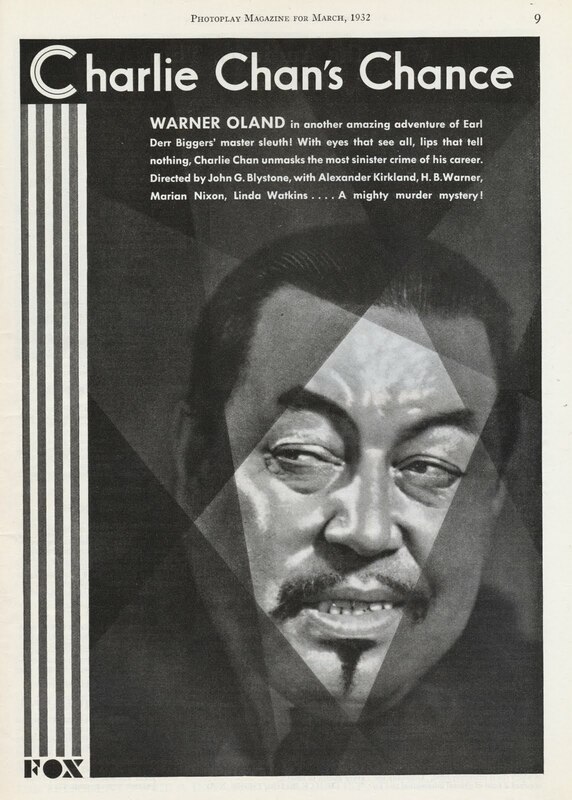 Later, popular Swedish actor Warner Oland (from Old San Francisco fame) took on the role of Chan. You may be asking yourself, what's a Swedish dude doing playing the part of a Chinaman? Although Oland was born in Sweden, he had Mongolian ancestry which made him look exotic. So for the movie studio Fox, he was Asian enough. Oland did the series and it became wildly popular. He died suddenly in 1938 and to keep the series going, they hired Scottish actor Sidney Toler to replace Oland. Toler made about 22 Chan films (some for Fox who then abandoned them and Toler bought the rights and made the rest with Monogram Pictures) until he passed away in 1947. To milk the last out of the money teat that was the Chan franchise, they hired American actor Roland Winters to film the last 6 pictures. In my honest opinion, Oland was the best Chan, Toler was good but not great and Winters was a disaster. Who is your favorite Chan? DVD Set: It's DVD not DVD-R which is excellent and the packaging is superb. Don't expect any extras though! 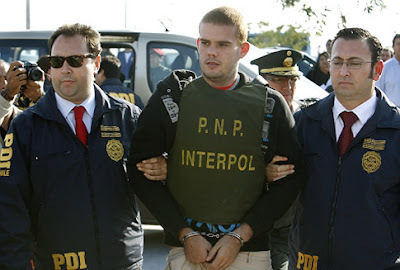 Dark Alibi: Ex-cons gone straight are being framed for various bank robberies. Charlie Chan, his son Jimmy Chan and assistant Birmingham Brown are on the case. This is an enjoyable mystery with a lot of humorous moments. Great watching for a rainy day. Dangerous Money: A murder on a cruise ship? Charlie Chan is on the case! Along with Jimmy Chan and Chattanooga Brown. This is the best film out of the set. Really enjoyable, great plot, lots of kooky characters and you'll keep changing your mind about who-dun-it. The Trap: A girl's been murdered on Malibu Beach, another one is missing and a whole bunch of others are in danger. Jimmy Chan is called onto the case but Charlie Chan takes over and is followed by Birmingham Brown. This is by far the worst film out of the set. The gaggle of gals are simply annoying and it's difficult to care about the characters or the story. The Chinese Ring: The princess of China has been murdered and someone is stealing money from her bank account. Charlie Chan (Roland Winters), Jimmy Chan and Birmingham Brown are on the case. Winters is simply awful as Chan but the story is good and it makes up for his shortfall [minor spoiler alert] This one is pretty dark especially since a child is murdered in the story. This boxed set goes on sale tomorrow, June 8th. This would make a great gift for a die-hard classic film buff or someone who likes short, easy mysteries. It's not for everyone though. Here are a couple of videos from YouTube that Warner Bros. sent me. They'll give you a good sense of the three main characters (Charlie Chan, Jimmy Chan and the exchangeable Browns) and of the style of these movies. Enjoy!